Almost sold out! Now 50% off to save you FOMO. There’s only around a hundred copies left. And I’d love to move them to create more space in my studio. Although published in 2009 it is still relevant today (if not more so). Copywriting in Action shows you how to write great copy. And it takes you through the creative and strategic processes involved to produce great copy. 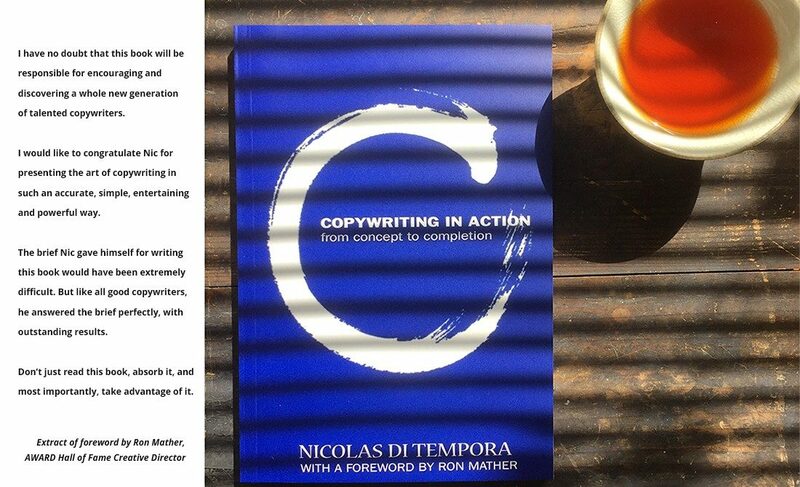 If there’s any book that truly develops you into an accomplished copywriter in all media, this is it. So if you’re in two minds about buying this book, let your Fear Of Missing Out do the deciding. That’s because it will not be re-published. From concept to completion, this highly acclaimed book presents five masterclasses on the act of writing quality content for on-and-off-line media. Never to be re-published again. Each chapter begins with a brief, then methodically works through the entire strategic and creative process until the most effective final draft is written. Because I want to write about other things now. So now is the perfect time to get yourself a copy while stocks last. Demonstrates the process, concept by concept, word by word and line by line, of just how you go about the art and science and psychology and music and sociology and etc. of writing clear, concise and compelling copy from concept to the final full stop.